I’ve been chasing summer this whole year, and December is no different. About a month ago, I got a cheap flight alert - PDX to Honolulu round trip for just $280. I sent a screenshot to my friends Candace and Dillon, and we were all kinda like… wow, what if we just booked that and went to Hawaii? So we did. I haven’t been back to Hawaii since I was about 12, when I went to Kaua’i with my family. I remember playing with geckos in the beach house we stayed at, watching the summer olympics and eating shave ice with my dad, attending a local luau and best of all, snorkeling. That Hawaii trip was a total highlight of my childhood, and it made me so excited for this trip! I was wondering how Oahu would be different, and what kind of experiences Hawaii had to offer for no-longer-kids. For the first 4 nights of our trip, we got an Airbnb on Waikiki Beach. It was super cheap and the location was incredible - a 5 min walk down to the ocean, right next to tons of amazing food spots and the main strip of shops there. However, the Airbnb property itself was kinda underwhelming. It was fine, but I think we only put up with it because we were gone all day every day. The last day we were in Honolulu, Dillon had left so Candace and I decided to splurge a lil and ditched the Airbnb for the Surfjack Hotel + Swim Club down the street from our first place. We found this place on IG and it looked SO cute! The rooms were amazing and it’s got a chic little bungalow type pool area, plus a trendy coffee shop called Olive + Oliver and upscale restaurant, Mahina and Suns, on site. I also loved that they bring in local artists and musicians every day to sell their work or provide entertainment. It really gives that Hawaiian vibe and I love seeing larger businesses support their community. Some other lovely hotels in the area are the Laylow, the Modern Honolulu, the Alohilani, the Mariott Waikiki Beach, and the Royal Hawaiian. Hotels in this area honestly are not cheap (why we went with an Airbnb for a few nights) - the best deals we saw were definitely for the Surfjack and the Modern on HotelTonight. Shameless plug, but if you use code “NEDANAN” on HotelTonight, it saves you $25 off your first booking. No, this isn’t sponsored, I wish it was haha. Just a little traveler tip, since some of the best deals are on there! There is SO much to do on Oahu. Although we did quite a bit of baking on the beach, we made an effort to see as much of the island as possible. The first day there, we hung out on Waikiki Beach, wandered around trying some of the local food spots near our place, and seeing what was cool for photos. 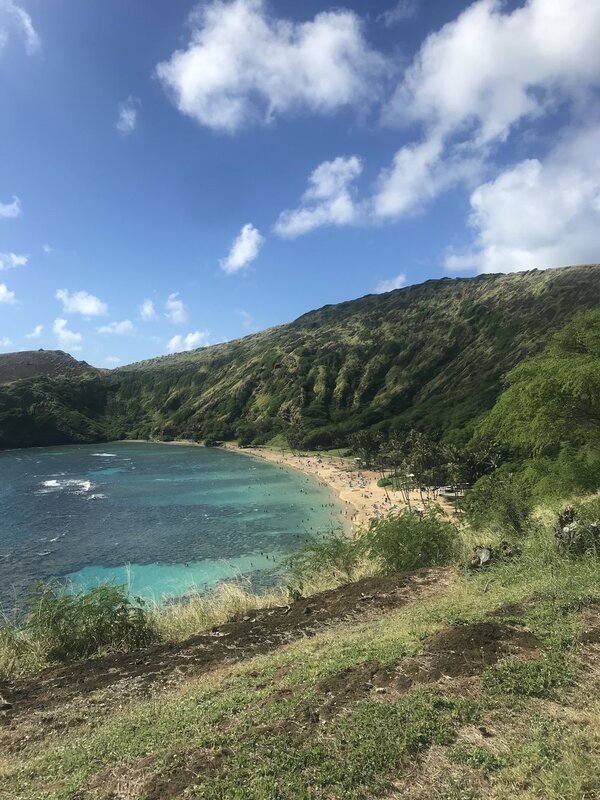 The second day, we checked out Hanauma Bay on recommendation of an Uber driver and we were not disappointed! The nature preserve there is stunning and really popular for snorkeling because of all the reef wildlife, and it was probably one of my fave beaches we went to. Dillon also got up at 5 am and hiked every morning. He did Koko Head, Diamond Head, and Waimea Falls! I was not a part of these hikes but I support his athleticism lol. The photos were amazing, and if hiking is something you’re into, Oahu has tons of good ones. We rented a car and drove up to the North Shore the next day, stopping along the way at Ho’omaluhia Botanical Gardens. This is a must-see! The views here are just breathtaking, and you can get that iconic middle-of-the-road IG photo (although there are literally signs everywhere saying no photos on the road, so don’t get caught!). These botanical gardens are home to thousands of rare tropical plants and trees exclusive to Hawaii, and they’re surrounded by this gorgeous mountain range. Once on the North Shore, we beach-hopped and ate everything in sight. For beaches there, we stopped by Laniakea Beach to see the turtles (we saw some in the water but an annoying tourist in, you guessed it, cargo shorts, scared them away), and then laid out and spent our day at Kawela Bay Beach Park. The beaches here are so serene and quiet, definitely a welcome change from the bustle of Honolulu. Besides us, the only other people around really were surfers. For breakfast we got açai bowls at Sunrise Shack, which is a cute lil spot in Haleiwa - really popular with the surfers. After the beach, we did açai bowls literally again at Haleiwa Bowls, which was better in my opinion! We also got the famous fresh poke bowls at the grocery store Foodland for the drive home. I already mentioned some of our favorite picks from the North Shore and the restaurant in our hotel, but there was no shortage of amazing food in Honolulu. Arvo is a cute little Aussie coffee shop in the art district area, serving up lavender lattes, charcoal lattes, matcha and the like, as well as avo toast, smoked salmon toast, and any number of cute breakfasty items with a floral accent. Absolutely loved the food and coffee here - I wish we went back! It’s also in a cute shopping center with other local businesses like a boba shop, a florist, and a vintage Hawaiian shirt retailer. Maguro Spot is an unsuspecting hole-in-the-wall poke restaurant that you can NOT miss. The poke here was insane - the type of fresh that melts in your mouth! We found it from it’s rave reviews on Yelp. Across the street is Musubi Iyasume Cafe, which was the best spam musubi I’ve had in a long time - again, crazy good Yelp reviews led us here. Aloha Kitchen is a lovely little breakfast spot with an island twist on traditional diner items - think Kahlua pork benedict and coconut souffle pancakes. Island Vintage Coffee - get the honey latte and the lilikoi açai bowl here! - was also a great breakfast/lunch stop and reminded me of Urth Caffe :) Rainbow Drive-In was the best traditional Hawaiian food we found. Love some good old fashioned shoyu chicken with 2 scoops of rice and creamy mac salad. Also, if you’re looking for a chic bar, check out the Laylow’s outdoor bar Hideout Waikiki - super cute drinks and great service. This trip was such a welcome vacation from all the work I’ve been doing and the stress I’ve been under lately. Sometimes you really just need to convince your best friends to go to Hawaii with you and take photos and veg out on the beach. Ugh, I can’t wait to go back.